In 1989, the collaborative Submerged Aquatic Vegetation Management Policy was enacted with the goal of increasing aquatic vegetation distribution, abundance, and species diversity, and an Implementation Plan was constructed the following year to ensure the goals of the plan could be reached.2 Also incorporated into Bay restoration were initiatives from Chesapeake Bay fisheries to support Bay recovery, including the Blue Crab Fishery Management Plan. 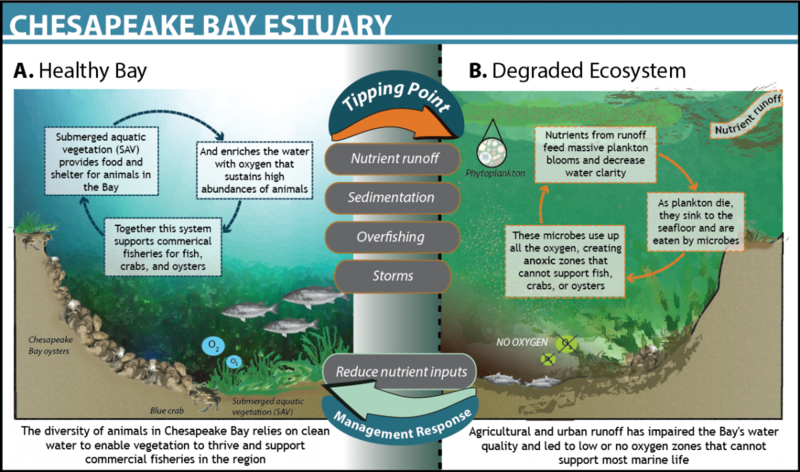 The scale and scope of the Chesapeake’s problems necessitates effective communication, collaboration and adaptive management among scientists, resource managers, politicians, and the general public across a very large geographic area (six states and the District of Columbia form its watershed). Restoration has proven expensive, challenging, and slow. Within these past few decades, collaboration has resulted in a growing number of policies, plans, regulations and laws that emphasize the value of aquatic vegetation in Chesapeake Bay and the need to protect and restore it.2 Implementation of these policies has relied heavily on voluntary adoption of best management practices by farmers and the educational, technical and financial support of many groups. Today, the Bay remains precariously out of balance, but incremental change over the last few years suggests that all the work and expense may be starting to pay off: the Bay appears to be on a positive trajectory, toward what managers and policymakers hope is a positive tipping point. 1Savage, J., and M. Ribaudo.. 2012. “Impact of environmental policies on the adoption of animal waste management practices in the Chesapeake Bay watershed.” Poster prepared for presentation at the Agricultural & Applied Economics Association 2012 AAEA Annual Meeting, Seattle, Washington. 2Orth, R.J., Batiuk, R.A., Bergstrom, P.W., and K.A. Moore. 2002. “A perspective on two decades of policies and regulations influencing the protection and restoration of submerged aquatic vegetation in Chesapeake Bay, USA.” Bulletin of Marine Science 71(3): 1391-1403. 3Chesapeake Bay Program. 2010. “Chesapeake Bay Total Maximum Daily Load (TMDL) Driving Actions to Clean Local Waters and the Chesapeake Bay.” http://www.epa.gov/chesapeakebaytmdl.